During an aerial survey on 2 November 1986 the summit crater [of Krenitzyn] was covered with snow. There was no indication of fumarolic activity in the summit area or in the area of the 1952 E-flank eruption. The Global Volcanism Program has no Weekly Reports available for Tao-Rusyr Caldera. The 7.5-km-wide Tao-Rusyr caldera on southern Onekotan Island is one of the most impressive volcanoes of the Kuril Islands. The basaltic-to-andesitic caldera is filled by the deep-blue 7-km-wide Kal'tsevoe lake, whose surface is 400 m above sea level. 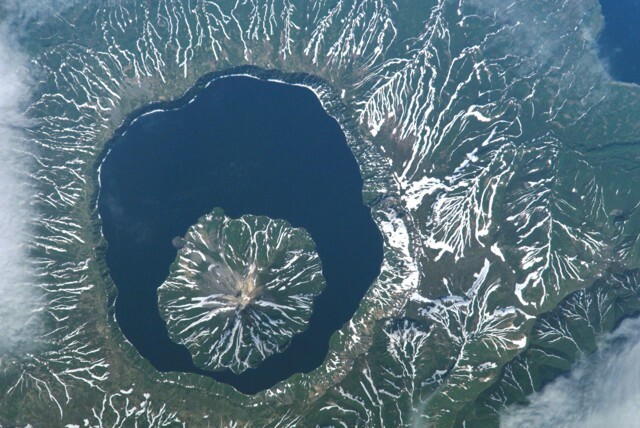 The caldera was formed about 7500 years ago during one of the largest Holocene eruptions in the Kuril Islands. A large symmetrical post-caldera cone, 1325-m-high andesitic Krenitzyn Peak, forms a 4-km wide island that towers high above the caldera rim and fills the NW portion of the caldera lake. A 350-m-wide, 100-m-deep crater truncates the peak and a large lateral crater is located on the upper NE side. 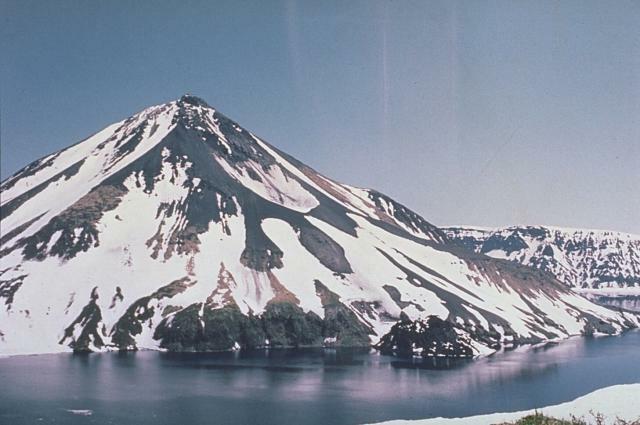 The only historical eruption of Krenitzyn Peak, in 1952, formed a small, mostly lacustral lava dome in an explosion crater along the east shore of the island. There is no Deformation History data available for Tao-Rusyr Caldera. There is no Emissions History data available for Tao-Rusyr Caldera. A large symmetrical post-caldera cone, 1325-m-high Krenitzyn Peak, forms a 4-km wide island that towers above the rim of 7.5-km-wide Tao-Rusyr caldera. A 350-m-wide crater caps the peak, and a large shallow lateral crater (left center) is located on the upper NE flank. The small dark mass along the eastern shoreline (right-center) is a lava dome that was emplaced in 1952 during the only historical eruption of the volcano. Kal'tsevoe lake fills a caldera that was formed about 7500 years ago during one of the largest Holocene eruptions in the Kuril Islands. Summer snow remnants highlight dendritic drainages cutting pyroclastic-flow deposits on the flanks of Tao-Rusyr caldera on Onekotan Island in this NASA Space Shuttle image (with north to the left). The 7.5-km-wide caldera was formed about 7500 years ago accompanied by the eruption of 30-35 cu km of tephra during one of the largest Holocene eruptions of the Kuril Islands. Subsequently Krenitzyn Peak stratovolcano was constructed in the NW part of the caldera, reaching a height well above the caldera rim. NASA Space Shuttle image ISS005-E-6518, 2002 (http://eol.jsc.nasa.gov/). Large Eruptions of Tao-Rusyr Caldera Information about large Quaternary eruptions (VEI >= 4) is cataloged in the Large Magnitude Explosive Volcanic Eruptions (LaMEVE) database of the Volcano Global Risk Identification and Analysis Project (VOGRIPA).